12 Month Storage "Wise Food"
Ready-made meals are packed in airtight NITROGEN PACKED pouches, and then encased in durable plastic containers. Our unique packaging process removes up to 98% of the residual oxygen through a vacuum oxygen removal and nitrogen flushing practice. Ready-made meals carry a shelf life of 25 years, with absolutely no rotation needed. That's 25 years without the stress of wondering if your family will have enough good, useable food when emergency strikes. Because our entrees won't need to be rotated every few years like other food storage products, buying Emergency Foods will save you thousands of dollars long-term as the cost of food keeps going up. 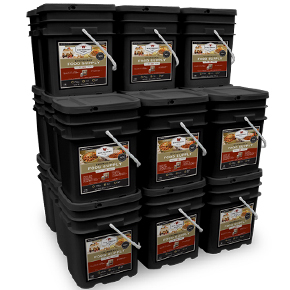 By investing in Emergency Meals you will again be saving thousands of dollars over the years. In an emergency, food may be worth more than diamonds or gold. Stock up today!